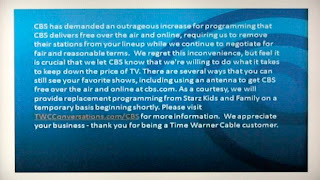 LOS ANGELES – Time Warner Cable's blackout of CBS continued Saturday, and neither side indicated a resolution of their dispute over fees is imminent. Time Warner dropped CBS Friday in New York, Los Angeles, Dallas and several other cities, leaving three million customers without the network's programs. The issue is fees that the cable company pays CBS to air its programs. Each has accused the other of making unreasonable demands. On Saturday the two sides even seemed to disagree on the status of negotiations. A Time Warner spokeswoman said Saturday afternoon that negotiations are ongoing. 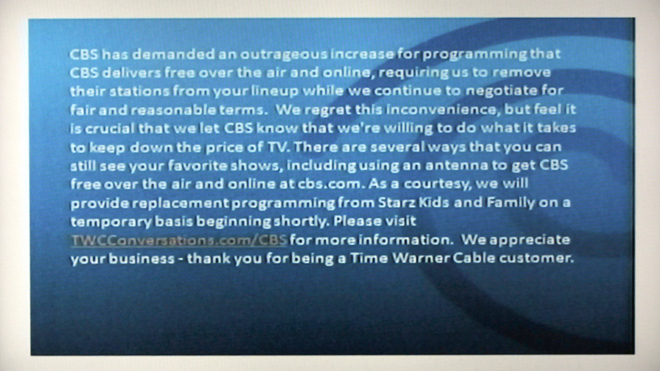 CBS said it expects talks to resume soon, but the decision rests with Time Warner. People, People .. can't we just all "get along"? The ongoing threat of EEVIL Assault Cars! One person has died and 11 others have been injured after a car drove into a crowd of people walking along the famed Venice Beach boardwalk early Saturday evening before the driver fled the busy Los Angeles tourist site. A Los Angeles Police spokesman said late Saturday that one person had been detained for questioning in nearby Santa Monica, though it was not immediately clear if the person detained was the driver. The driver was a man described as having sandy blond hair and estimated to be in his mid-20s, [emphasis added] authorities said. Multiple witnesses reported that the driver appeared to be "moving purposefully" and in control of the car as it plowed through the crowd, Los Angeles Fire Department spokesman Brian Humphrey said. The car was still moving as it drove out of sight of firefighters and the people who were hit. When is America going to wake up to the ongoing threat of unregistered Assault Automobiles? Why do we allow our young people, who are obviously too immature to understand the terrible responsibility they assume when they buy Assault Cars (which are available to anyone at Car Shows without background checks!) to possess these Weapons of Mass Destruction? Shouldn't we at least require purchasers of Full-Auto Assault Cars to demonstrate a proficiency in the operation of these high-power weapons? This is clearly a situation which begs .. nay, REQUIRES ... Federal control. In the past, there were no restrictions; anyone could buy a car. But that was back in the days when cars had only small, two-cylinder engines. Cars then couldn't travel much more than walking speeds. Now anyone can buy a V8 engine. Surely our forefathers did not envision the day when eight-cylinder engines were available. If they had, they would have established restrictions on cars with more than two cylinders! Imagine if they had realized that cars could be purchased which had a terminal velocity of over a hundred miles an hour. In a Nation which famously established a speed limit of 55 miles an hour, there is clearly no NEED for a car which can travel at over twice that speed. Even interstate freeways have a speed limit of no more than 65 or 70mph. Why do the irresponsible car manufacturers persist in building cars with the possibility of going more than the legal speed? Conservatives point out that the 55MPH speed limit, which was a progressive movement in the 1970's, had proven to be "less than effective" at meeting the stated goals of that Federal law. We all know that the true purpose was to keep irresponsible car owners from unregulated access to Weapons of Mass Distruction ... Assault Cars! But they, the evil Conservatives, had a Secret Weapon: The AAA! This nefarious Special Interest Group lobbied senators, threatened Representatives with the withdrawal of political (and financial) support, until our poor beleagured Congressmen had to choose between bowing to the powerful Lobbiest or facing defeat at the polls. This is the result of powerful Special Interest Groups. Even though the AAA has over 60,000,000 members, it is unconscionable that our elected representatives should bow under lobbyist pressure on an issue which is so clearly vital to the safety of the American Public. It's clearly time for right-thinking Americans to rise up against these Special Interest Groups. Write your congressman! Tell him (or her, or it, as the case may be) that you are opposed to the ... well, perhaps not illegal, but clearly WRONG .. pressure exerted by these special-interest voting blocks. Who cares if the AAA has all those votes in their pockets? Clearly, it is time that our brave senators and representatives rise up and Vote Their Conscience! The votes of millions of Americans count as nothing when compared to those of dozens of Right-Thinking (okay, Left-Thinking) Americans who KNOW that the average citizen is neither bright enough, not responsible enough, to be trusted with an Evil Assault Car! Now .. go vote for Obama and help him stop this travesty now! You know it's The Right Thing To Do. Do it for the children.